Time for a back-up plan for your Twitter back-up plan. 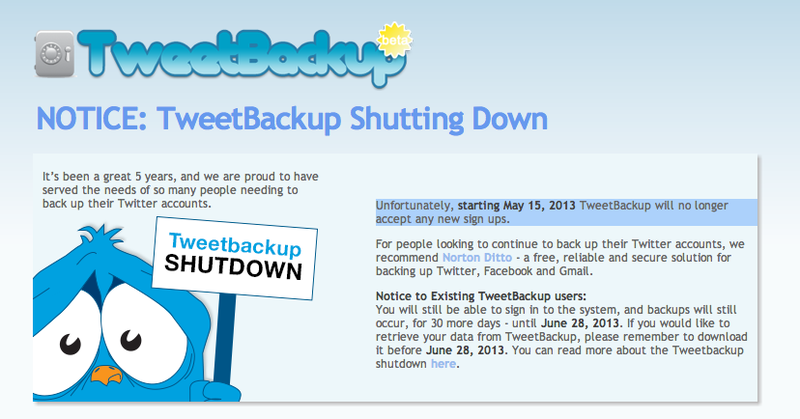 Backupify — the Cambridge, MA cloud-based backup, search and restore provider for online services — is shutting down TweetBackup, a company originally founded in Sweden that Backupify acquired in 2010 for an undisclosed amount. Tweetbackup has posted a note about the closure on its site, as well as — yes — on its Twitter account, noting that new signups are stopping as of today, and that existing users will have 30 days, until June 28, to keep logging into their accounts and back up their Twitter data elsewhere. On one of the two FAQ pages that Backupify has created to answer some questions about the service, it suggests a couple of alternatives to TweetBackup’s subscribers: for business users, the company recommends Backupify’s own-branded service; for consumers, it suggests going somewhere else altogether, either Ditto from Norton Labs, owned by one of Backupify’s strategic investors, Symantec; or SocialSafe. We are reaching out to the company to find out more, but it looks like this is part of a larger strategy at the company to reposition itself more closely on its enterprise services and away from lower cost/free consumer offerings. “We always intended to have Tweetbackup users join Backupify’s base Twitter service,” Backupify’s Jason Ellis notes. And in July 2012, when Backupify announced the $9 million round in which Symantec invested, it noted that the free services (TweetBackup was one) were there for lead-generation for paid apps. It is not clear how many active users TweetBackup has at the moment. In 2010, the company had a policy of requiring users of its service to follow it on Twitter — evidenced at that time because @tweetbackup was the only account Wikileaks was following at the height of its controversy with Amazon and PayPal over contributions via their payment systems. By that measure, Tweetbackup had around 57,382 users, although the same platform is likely also used as part of Backupify’s wider Personal Apps social media backup service. Last year when Backupify announced its Series C round of funding it had 170,000 users, free and paid. Meanwhile, there are other services like FrostBox and SocialSafe that back up multiple social media accounts. Both of these are now offering free, six month licenses to TweetBackup refugees.